Today, with its application across a wide range of different disciplines and fields, design is being used to help address significant, complex, and global issues ranging from antimicrobial resistance to mobility, from healthy ageing to migration. And with its inherent agility and applicability, design helps shape the technological advances which are transforming the world around us. In recent years, design research has witnessed a “social turn” where researchers have looked to make change in social contexts as opposed to wholly commercial ends. This “social turn” has encompassed a range of activities and interventions that constitute a more “socially-driven” form of design, which suggests that researchers and practitioners from non-design disciplines are central to realising change in social situations. The audience for this symposium is wide and will not only include design researchers, design practitioners, and design academics BUT will be of significant interest to researchers in other areas including (but not limited to) education, healthcare, government, biotechnology, engineering, management, computing, and business. Given the reach and interdisciplinary nature of many forms of contemporary design research it is anticipated that this symposium will be of interest to practitioners and researchers in a wide range of disciplines. The DR4C Symposium is a much-needed, timely, and significant one. The themes proposed (below) are intended to be inclusive (not exhaustive) and contributions are very welcome that challenge these areas and others. The DR4C Symposium aims to include a rich mix of design-led research papers, from authors across the world. This will include papers where design research traverses disciplinary, methodological, geographical and conceptual boundaries that highlights the wide-ranging social, cultural and economic impact of emerging forms of design research. We expect that collaboration will be a key factor in these Design Research for Change Symposium papers drawing on expertise, for example, in areas such as business, engineering, environmental science, health and wellbeing working alongside a wide range of design researchers. We invite authors to submit high-quality, previously unpublished, original contributions that explore one or more of the DR4C Symposium themes. Submitted papers will be assessed through a double-blind review process and accepted papers will be published in a Design Research for Change book. What are we as design researchers with other researchers changing? Why? What difference(s) is your design research actually making? Who decides/evaluates if this change is “positive” or “good” or “enough”? What impact has your change delivered? At what cost? Why is your design research concerned with change-making? What have you tried to change through your design research? Who has activated the change? And who has been affected by that change? How have you delivered change though your design research? What evidence do you have for the change that you claim? When has your design research brought about positive change and when has it been detrimental? Where else have you seen change happening? What should design research change now? Can design research really change anything? What will you do to make change? In what ways do you envision the impact of such change to be evaluated? DR4C papers should be a maximum of 5,000 words (excluding references) and should include relevant images. Submissions should be anonymised for double-blind review. 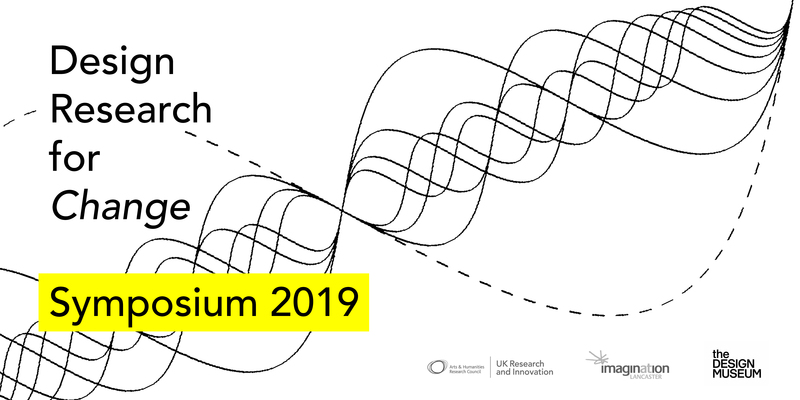 Accepted paper authors will be given a 30-minute single-track presentation slot at the Design Research for Change Symposium at the Design Museum, London on Wednesday 11 and Thursday 12 December 2019. Submissions should be in PDF format. * DR4C papers should be emailed to p.rodgers@lancaster.ac.uk before 5 May 2019. The Design Research for Change (DR4C) Symposium is supported by the Arts and Humanities Research Council (AHRC) under the AHRC’s Design Priority Area Leadership Fellowship scheme (Award Ref: AH/P013619/1) and the Design Museum, London.